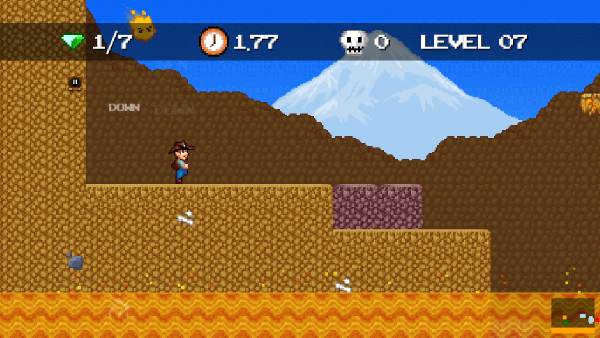 The 1.5 version of VolChaos is now available on Desura and itch.io. This update includes updates to most levels, a full screen / windowed mode toggle (previously the game ran full screen only), and a few minor UI tweaks. It'll probably be the last PC update for a while (unless there are any breaking bugs) as I shift focus to the PS4/Steam ports. Purple blocks, new in 1.5! My lord! I wanted to name the VolChaos PS4/Steam port with some kind of subtitle to indicate it's a better than normal edition. For the moment I've been referring to it as “Red Hot Edition”. I don't know if that will stick (I kinda want something crazier) but that is what we have for now. After months of working on the VolChaos PS4 (and Steam!) port, this week marked an important milestone, I actually worked on making a new level for the game! Given that I've been working on this port for several months that may seem strange, but there was a lot to do first. Porting the game, cleaning things up, massive updates to the existing levels, etc. Given the fact that I've already made 42 levels and tweaked them numerous times, I feel really good about the quality I'll be able to give the new 18 levels (oh yeah, I'm adding 18 new levels). Besides being more experienced at making VolChaos levels than when I started, many of the mechanics and enemies weren't available from day one either. Moving platforms for instance I added much later in development and aren't utilized to their fullest in the original 42 levels. I've long since given up on trying to accurately place a release date until very close to the release date of the game. I would like to release both Steam and PS4 VolChaos concurrently but that will require getting through the approval process with both Steam and Sony at roughly the same time (I believe Sony will likely be the far more difficult of the two). I'd originally projected releasing on PS4 in February or March but with VolChaos being Greenlit (something I wasn't anticipating so soon), I ended up doing a lot to clean up the PC version that I did not expect to be doing. I'm hoping I can release in the next 2-3 months but being an indie developer without a publisher forcing a deadline on me means that I can take as long as I need to get it right. The major remaining piece is creating all the new levels, everything else is going to be minor tweaks and platform specific changes (of which I don't anticipate many besides Achievements/Trophies). There are no comments yet for this post. Don't be shy, add your comment below! Verify: * How many characters in your name (spaces included)? Enter numbers only. Comments: * Text only comments, none of that fancy HTML stuff here.